Songs At last! 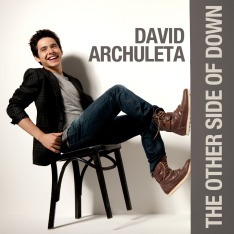 David Archuleta’s new album, The Other Side of Down, has been released. Now the Song of the Week will be chosen from these twelve tracks. If you don’t have a copy yet, purchase yours today. You’ve heard the expression, “that singer can really sell a song.” I had heard David Archuleta sing “Elevator” a few times and I thought it was a ‘cute’ song. Then I heard his recent Z100 performance in New York City and I ‘bought it’. I paid full price! Would gladly have paid more. Because David really sold me that song. I own it now. Just listen to him get into that “elevator” and take you for a ride. Written by Shelly Peiken, David Archuleta, and his guitarist, Mike Krompass. Premiered as a single on September 14 on AOL Radio. Read and print the “Elevator” lyrics. Buy “Elevator” and all the other songs from David Archuleta’s Official Store. Let’s never forget David’s debut album! Most of the songs from Katie’s collection of Songs of the Week are from David Archuleta.